SDI Matrix Switchers Corporation WolfPack™ SDI Modular HDMI Matrix Switchers are integrated SDI video and audio modular SDI Matrix Switchers that uses the below SDI input and SDI output cards. By having SDI slide in cards the matrices are very reliable as in the unlikely even there is a loss of signal you just replace the card with a spare you have purchased or order another from us. The complete matrix doesn't have to be sent to us for a repair. 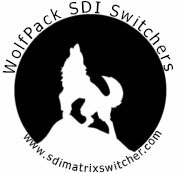 The WolfPack Modular SDI Matrix Routers manage many types of SDI signals. Our Modular SDI Matrix Switchers also can support high-resolution SDI sources routed to SDI displays, monitors, projectors, or other SDI devices. The EDID can be selected between seven different modes or copied from the attached displays.